The Mount Panorama Circuit in Bathurst, New South Wales, Australia, is the race track which has a status of the sacred place in the Australian motorsport history, as it’s hosting the greatest Australian race – the Bathurst 1000 race for touring cars. The event is part of the V8 Supercars Championship. Together with the Formula One Australian Grand Prix, this race forms the two biggest and most important race events in Australia. Mount Panorama is also home of the Bathurst 12 Hour race, which has been one of the most popular international endurance races for GT cars since 2011. Mount Panorama, Motor Racing Circuit Bathurst or simply Bathurst, is a track opened in 1938. The track is 6213 meters long, runs in an anti-clockwise direction and has 23 turns. 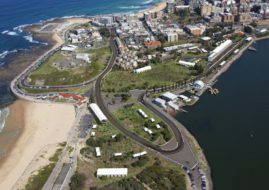 It’s technically a street circuit, as it is consisted of a public road that is accessible for free-of-charge driving in both directions when no racing events are on. The track is unusual by modern standards because of the 174-metre vertical difference between its highest and lowest points. One more unusual and interesting fact is that the start line and the finish line aren’t in the same place. In fact, for the standing start only, the start line is 143 m closer to the first corner. Bathurst offers the unique combination of tight curves and long straights with a maximum of about 300 km/h. The most known part of the track is The Chase, the chicane made in 1987 to slow down the cars at the mile-long Conrod Straight. The section was dedicated to Mike Burgmann, who had died in an accident at the chicane’s spot in the previous year. Burgmann’s death (the first Bathurst 1000 fatality) had prompted the building of The Chase. The high-speed Conrod Straight is unfortunately somewhat notorious, for it is also the venue where five out of six fatalities with racing cars took place. Overall, sixteen racers and two spectator have died at the Mount Panorama Circuit, including the 1967 F1 champion Denny Hulme, who passed away in 1992 after suffering a heart attack while driving a BMW M3 in the Bathurst 1000 race. Other car racing drivers killed at Bathurst include Reg Smith (1960), Tom Sulman (1970), Mike Burgmann (1986), Don Watson (1994) and Mark Porter (2006). The very first race held at the Mount Panorama circuit was the 1938 Australian Grand Prix. One of the first events was a speed hillclimb held from Mountain Straight up to Reid Park. This event is still held today as a round of the NSW Hillclimb Championship. The Australian Grand Prix has been organized here four times (1938, 1947, 1952 and 1958). The Bathurst 12 Hour race was on a schedule from 1991 to 1994 and then again from 2007, and the Bathurst 24 Hour race was driven twice (2002 and 2003). The concept of the race originated with the Armstrong 500 race which was held at the Phillip Island from 1960 to 1962. In 1963, Armstrong 500 moved to Mount Panorama. The first years on the Mount Panorama circuit were dominated by swift and agile small cars, such as the Ford Cortina and Mini Cooper. The winner of the 1966 race was the rally legend Rauno Aaltonen with Morris Cooper S. It was the last 4-cylinder car victory for more than two decades. In 1967, the rules changed and mandated a minimum number of pit-stops to negate the advantage economical smaller cars had of requiring fewer stops. This change favoured the larger, thirstier Fords and Holdens and that year the winner was Harry Firth with a Ford XR Falcon GT. It was Firth’s fourth win. In 1966 and 1967, an Irish tobacco company sponsored the race which was rechristened into Gallaher 500. Since 1968, the name has been the Hardie-Ferodo 500 after the brake-parts manufacturer took sponsorship. The popularity of the race grew rapidly. Most Australian manufacturers and assemblers became heavily involved. A good result in the long and tough race added credibility to the cars and their brands, especially in terms of performance, durability and reliability. It was during this period that the famous Holden-Ford-Chrysler rivalry originated. The Series Production battle between the “Big Three” was fought at Bathurst. This rivalry spawned Australia’s most famous muscle cars, reverentially known as “Bathurst Specials”. Ford’s Falcon GT, and later GT-HO, Holden’s Monaro and Torana, and Chrysler’s Pacer and Charger models were the result of the constant development of race-worthy cars that the general public could buy. The 1969 race saw the debut of Peter Brock, who later became ‘The King of the Mountain’, the biggest of all Bathurst drivers, with 9 victories. His first win followed in 1972, with a Holden Torana GTR XU-1. It was the last 500-mile race, after that, the distance was increased to 1000 km. The winner of the first 1000-km race was Canadian Allan Moffat in a Ford XA Falcon GT. It was his third victory at Bathurst. Moffat was the first and one of the rare non-Australians who won at Bathurst. He achieved his fourth and last win in 1977, together with Jacky Ickx. From 1985 to 1992, the Great Race was run according to international Group A regulations, so, imported turbocharged cars were highly competitive and achieved dominance. Winning cars were Jaguar XJ-S, Ford Sierra RS Cosworth and Nissan Skyline GT-R. On the other hand, Group A enabled Australian teams to develop cars that could be raced overseas. In 1987, the Bathurst 1000 became a round of the short lived 1987 World Touring Car Championship. European teams raced against local Australian teams. Some European Teams, most prominently Rudi Eggenberger, ran questionable vehicles. His cars finished first and second on the road but were disqualified months later due to bodywork irregularities. The race win was therefore awarded to third-placed Peter Brock and team-mates Peter McLeod and David Parsons, who drove a Holden VL Commodore. After the Group A faded away in 1993, the Australian Touring Car concept was created for V8-powered Ford Falcons and Holden Commodores. This concept later evolved into the current V8 Supercar category. The regulations also created a separate class for 2-litre cars. From 1997 to 1999, due to television rights issues there were few separate races at Bathurst each year. Since 1999, Bathurst 1000 has become an exclusive race for V8 Supercars and that’s the current agreement. As mentioned earlier, Peter Brock is the most successful driver at Bathurst with 9 wins (1972, 1975, 1978-1980, 1982-1984 and 1987). Since 2006 and his tragic death, the trophy for the race winner was named Peter Brock Trophy. Jim Richards won the race seven times and also holds the record for the most starts (35). Larry Perkins, Mark Skaife and Craig Lowndes have six victories each. We already mentioned Canadian Allan Moffat, who won four times. Along with him, other non-Australian winners are Finn Rauno Aaltonen, Britons John Fitzpatrick and Win Percy, Belgian Jacky Ickx, German Armin Hahne, Swed Rickard Rydell and New Zealanders Jim Richards, Greg Murphy and Steven Richards. The Bathurst 12 Hour race, which was inaugurated in 1991, discontinued after 1995 and then revived in 2007, initially was an event for the production cars. In 2011, GT cars fulfilled a grid and after that, the race became the must-visit event among world’s best GT racers. In recent years, the race is a part of the Intercontinental GT Challenge. The Australian racing legend John Bowe is the only driver so far to score three wins at Bathurst 12 Hour. Among two-time winners is Craig Lowndes, whose total number of wins in major races at Mount Panorama is eight.